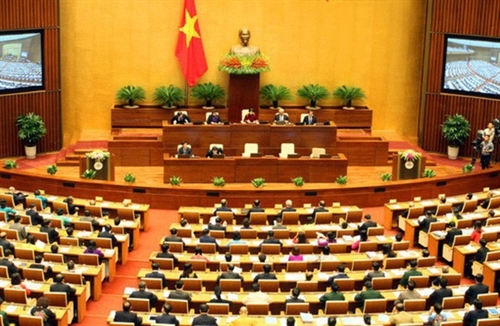 The fifth session of the 14th National Assembly opened in Hanoi on May 21, with eight draft laws and one draft resolution expected to be passed during the event which will last for 20 working days. Speaking at a press conference on May 19, NA General Secretary and head of the NA Office Nguyen Hanh Phuc said that lawmakers will spend 12 days to debate and adopt the draft Law on Denunciation (revised), Law on Special Administrative and Economic Units, Law on Measurement and Maps, Law on Competition (revised), Law on Cyber Security, Law on National Defense (revised), Law on amendments and supplements to several articles of the Law on Physical Activity and Sports, and Law Amending and Supplementing a Number of Articles of the Law on Planning, together with the resolution on the NA’s supervision program and the establishment of a specialized supervision group in 2019. Eight other bills will be tabled for discussion, which are the Law on Corruption Prevention (revised), Law on the People’s Public Security Force, Law on Husbandry, Law on Cultivation, Law Amending and Supplementing a Number of Articles of the Law on Amnesty, Law on Marine Police, Law Amending and Supplementing a Number of Articles of the Law on Education, and Law Amending and Supplementing a Number of Articles of the Law on Higher Education. In addition, the NA will conduct supreme supervision of the implementation of policies and laws on the use and management of State capital and assets in enterprises and the equitisation of State-owned enterprise during 2011-2016. Phuc said that the fifth session takes place in the middle of 2018 - an important year of the 2016-2021 tenure. Therefore, the session’s working agenda is of significance, contributing to continued successful implementation of the Party, National Assembly and Government’s resolutions, as well as rapid and sustainable socio-economic development. According to the NA General Secretary, the legislative body will continue to reform the question-&-answer activity at the upcoming session in the direction of increasing dialogue and face-to-face debate.